You know, there may be people who are wondering what Kondo-san from Hatena1 is doing here.1 Hatena Co., Ltd: A company responsible for developing a variety of Japan-based Internet services. Founded in 2001,its corporate headquarters is located in Kyoto. You’ve been working with us ever since we decided to make Miiverse. 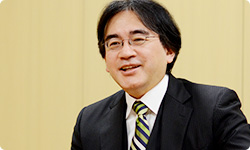 Today’s "Iwata Asks" is about the producers of Miiverse. Thank you for coming. Miiverse is a network service that’s integrated at the very core of Wii U. It allows people from all over the world to connect with each other through their Mii characters. In the plaza of their favourite games, players can share their thoughts, post hand-drawn illustrations, write comments and enjoy interacting with each other.And in addition to being able to exchange each other’s ID numbers as with the previous Friend Codes2, Miiverse makes it possible to become friends with someone more easily. Please introduce yourselves – starting with you, Kondo-san.2 Friend Code: A unique ID allocated when a Wii, Nintendo DS or Nintendo 3DS owner connects to the Internet. By exchanging Friend Codes, players can play games together online. I’m Kondo from Hatena. I was in charge of making the original concept for Miiverse. It’s a pleasure to be here. I’m Mizuki from Nintendo’s Network Business Department. For Miiverse, I was sort of a producer or director. You’re also the one who first brought up Miiverse. Mizuki-san, would you tell us about how Miiverse began? Sure. In all honesty, Miiverse began for me with Wii no Ma3, which ended back in April. The structure of the service is totally different, though.3 Wii no Ma (Wii Room): A Wii Channel available in Japan from May 2009 to April 2012. Wii no Ma was a "living room communication channel" featuring three services: Shopping, Home Theater and Ironna Ma (Various Rooms). Users could use pay services to shop for gourmet items, daily necessities, fashion items, home decoration and original products only available through Wii no Ma. They could also rent movies, anime and classic television programs for viewing. At the time, you were doing work on the client side of Wii no Ma. Yes. I’d been discussing what the Wii U’s network service should be like with (Yusuke) Beppu-san4 of Wii no Ma Co., Ltd.5 It was more like chatting than actual discussion though, and Beppu-san kept wondering if we could do something representative of Nintendo that was focused on Mii characters.4 Yusuke Beppu: Former president of Wii no Ma Co., Ltd. 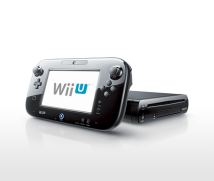 Currently president of Nintendo Network Service Co., Ltd.5 Wii no Ma Co., Ltd.: The company that operated Wii no Ma. It was co-founded by Nintendo and Dentsu. Its name has now been changed to Nintendo Network Service Co., Ltd.
Well, Wii no Ma in itself was a service that was unmistakably representative of Nintendo. Yes. What we wanted to do was surprisingly similar. With Wii no Ma, however, the operation side basically made the content and provided it to users. But that meant we couldn’t update it very frequently, which is something I really regret. We updated it every day, but depending on the users on the receiving end, sometimes they would find what we distributed to be interesting and sometimes they wouldn’t. So it was very challenging to try to satisfy everyone with the limited amount of content we could produce. Yes. So instead of making everything ourselves for users to enjoy, we thought maybe we should set up a UGC6 service so that more people could participate.6 UGC (user-generated content): This is a general term for all kinds of media content created by users. When you look at Wii no Ma and Miiverse, they hardly share anything in common except the Mii characters. But if Mizuki-san hadn’t worked on Wii no Ma and hadn’t experienced the difficulty of updating content every day, then Miiverse might never have come to be. When I made the presentation for Miiverse, I think I described it as something like a "new network service using Mii characters," and was surprised when you, Iwata-san, called it a "empathy network." When I heard what you said, I thought that if people who had experienced the same game got together and said "Yes, yes, I thought so, too," and connected via that kind of empathy, they would both be happy. We needed to figure out how we could design the service so that people would empathise with each other as much as possible, so I labeled it a empathy network. At that time, the core of Miiverse was people with a certain play history interacting in an online community. Miiverse is a service integrated into the game console itself, so if players can check each other’s play histories, they can interact on that basis. They have the same experiences, so it’s easier to interact. Then I discussed it, or rather chatted about it (laughs) with all kinds of people; not just in-house development producers and directors, but also the advertising department and people involved in sales, and began filling in the specifications. For a certain time, you spent some time going around the company chatting? Yes. So rather than thinking of it myself, as I talked with others, what was vague gradually became clear. The WaraWara Plaza7, which we were previously calling Mii Wara Wara, was also like that.7 WaraWara Plaza: A screen that shows game icons and the Mii characters of people playing those games when the Wii U console is turned on. The game icons may not be for games the console owner has played. Lots of Mii characters bustle around, while comments and such appear on the screen. It can be described as a home screen that also recommends games to the user. In Japanese, ‘warawara’ literally means ‘bustling’ or ‘busy’. Early on, you talked about something that would have a bunch of Mii characters come out and bustle around. That’s right. One of the people I chatted with was (Koichi) Kawamoto-san8, who worked on StreetPass Mii Plaza.9 He said that instead of having a screen like a normal Internet service, he wanted something distinctive. I thought that was right, and we chatted about having the Mii characters come out and bustle around.Later, the team making the menu for the Wii U console said, "Let’s have the Mii characters come out and bustle around on the Wii U’s startup screen," and they polished Mii Wara Wara up to its current form.8 Koichi Kawamoto: Software Development & Design Department, Software Planning & Development Division. 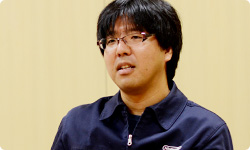 He was in charge of direction for StreetPass Mii Plaza for the Nintendo 3DS system and AR Games, which made use of the included AR Cards. Previously appeared in: A Little Bit Of… Brain Training and Nintendo 3DS Pre-installed Software.9 StreetPass Mii Plaza: An application built into the Nintendo 3DS system featuring a plaza where Mii characters belonging to other people gather. A user can fill up their plaza by passing near to other Nintendo 3DS users with StreetPass activated in the street. Users may then view other people’s profiles and play games like StreetPass Quest and Puzzle Swap. The Wii U console menu is actually coordinated by (Hisashi) Nogami-san10, director of Animal Crossing.1110 Hisashi Nogami: Software Development Department, Entertainment Analysis & Development Division. 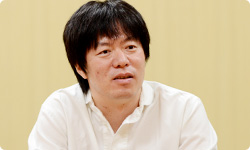 He is the director of the Animal Crossing series. Previously appeared in: Animal Crossing: City Folk.11 Animal Crossing: The first Animal Crossing game was released for Nintendo 64 in April 2001. The most recent game in the series is Animal Crossing: New Leaf, scheduled for release for the Nintendo 3DS system on November 8, 2012 in Japan and will be released in Europe in early 2013. (Katsuya) Eguchi-san12, the general producer of Wii U, and Nogami-san, with their experience on Animal Crossing, agreed to the Miiverse concept at a pretty early stage. Thanks to Eguchi-san’s efforts, games like New Super Mario Bros. U13 and Nintendo Land14 are compatible with Miiverse.12 Katsuya Eguchi: Software Development Department, Entertainment Analysis & Development Division. 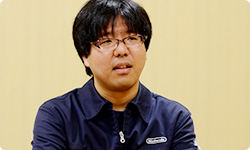 He is the producer of games like the Animal Crossing series, Wii Sports and Wii Sports Resort. Previously appeared in: Super Mario developers for the Super Mario Bros. 25th Anniversary (Volume 1) and the special edition at E3 2012 regarding the Wii U console.13 New Super Mario Bros. U: The latest game in the Super Mario series, scheduled for simultaneous release with the Wii U console on 8 December, 2012 in Japan and on 30 November in Europe.14 Nintendo Land: An interactive theme park game scheduled for simultaneous release with the Wii U console on 8 December, 2012 in Japan, and on 30 November in Europe. Yeah, the moment I saw the original form of WaraWara Plaza – what we used to call Mii Wara Wara – I could tell this was serious. That was the moment that Miiverse totally transformed. Another reason that Eguchi-san and Nogami-san responded to Miiverse was because they regretted how there wasn’t enough of a "live" feeling when they worked on that Animal Crossing official homepage project15 for sharing player comments and had to select the content for posting. They both talked about how Miiverse had to be a service that the players could use more freely.15 Animal Crossing official homepage project: The Japanese version of the official Nintendo website for Animal Crossing had a special bulletin board called Everyone’s News, where users could post play tips and comments. In that sense, they had wanted to do that ever since Animal Crossing, but back then the capability simply wasn’t there. If the Animal Crossing people hadn’t been in charge of the console menu or Eguchi-san hadn’t been the overall producer, Miiverse wouldn’t have received support from people like that and may have ended up in a slightly different form.